Maria del Pilar Troncoso, President of ASIPI, represented the association at the 37th Annual Conference of the European Communities Trade Mark Association (ECTA), held in the city of Athens, Greece, from June 13 to 16, 2018. 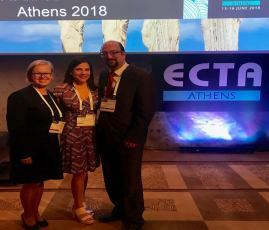 During the event, Maria del Pilar Troncoso had the opportunity to meet with the President-elect for the new term, Mr. Sozos-Christos Theoloudou, as well as with Ruta Olmane, outgoing President of the Association. The meeting served to strengthen the ties of collaboration between both associations, as well as to evaluate and develop initiatives together.